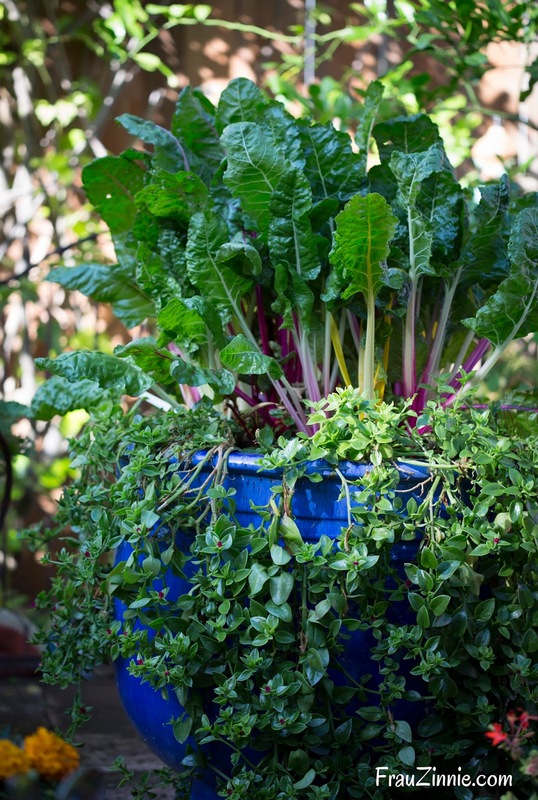 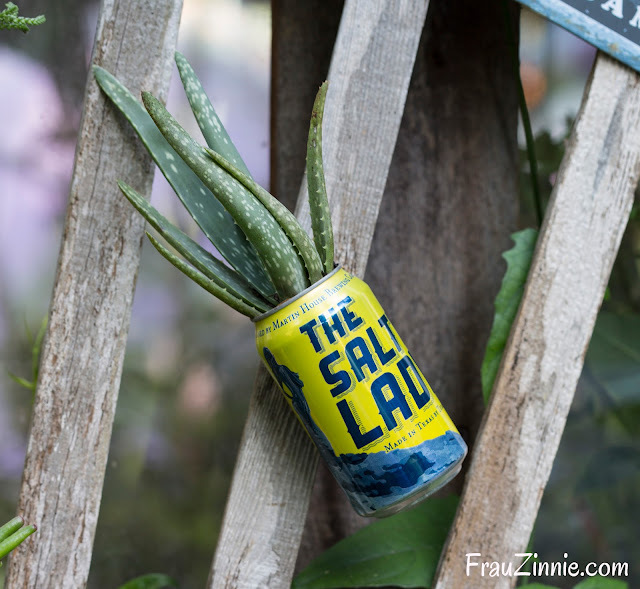 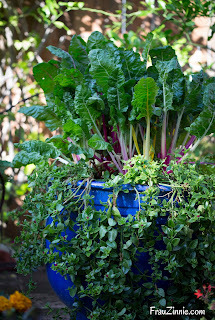 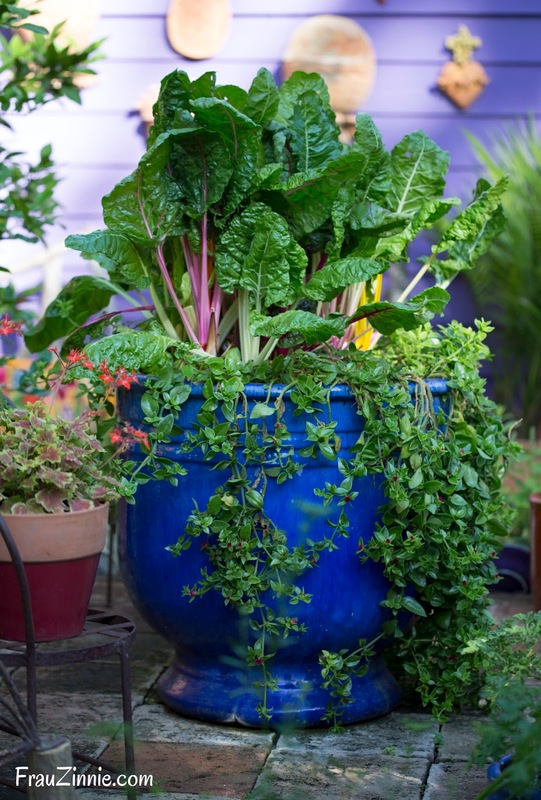 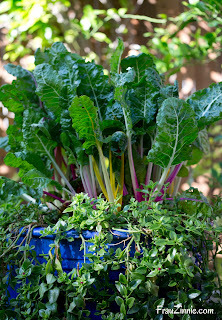 AUSTIN, Texas — Of all the magical elements on display in author Lucinda Hutson's garden during the recent Garden Bloggers Fling, one combination that stands out in my mind is the use of Swiss chard as a thriller in a (very) large container. 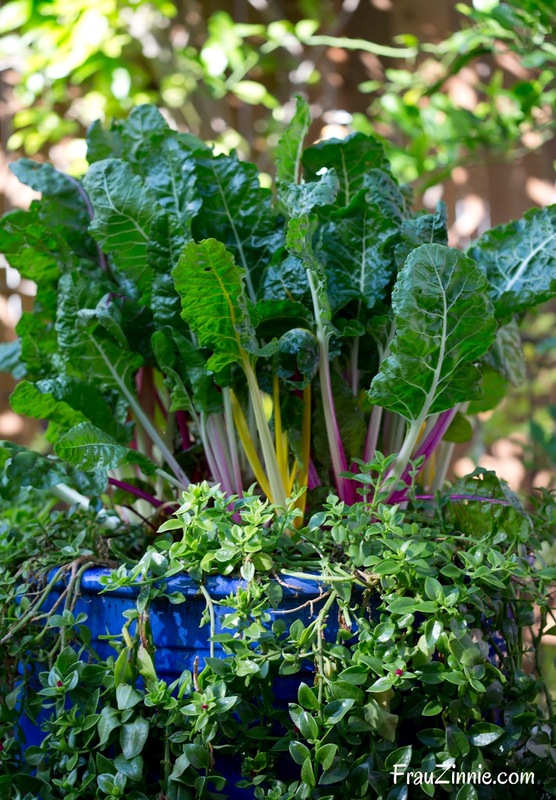 You know when a gardener can get you excited about Swiss chard, that you are in a very special garden indeed. With her 1940s purple cottage-style home tying the entire property together, it also acted as a fantastic backdrop to the gardens. 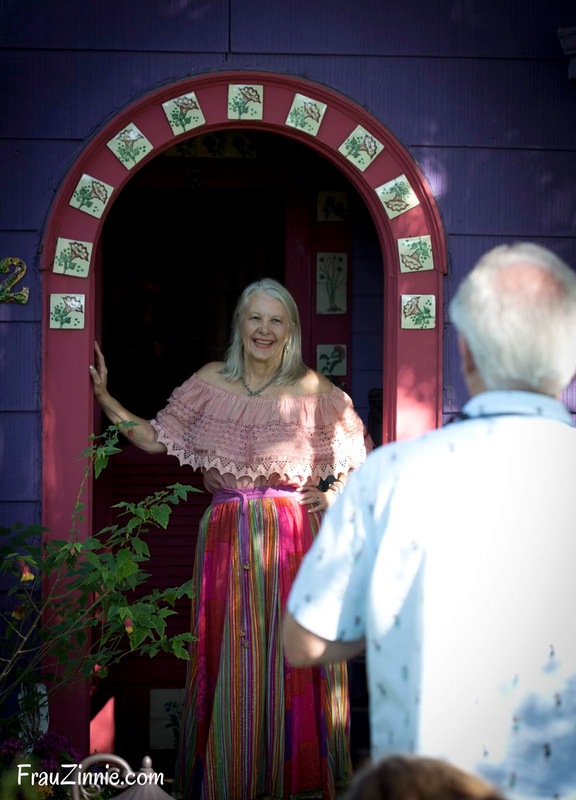 Hutson graciously allowed the bloggers into her home as well, which showcased the influence of her previously published books. 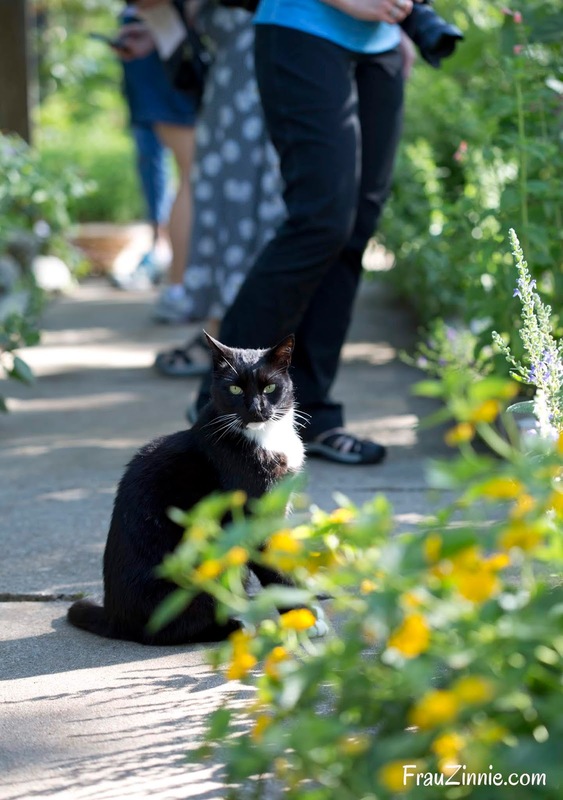 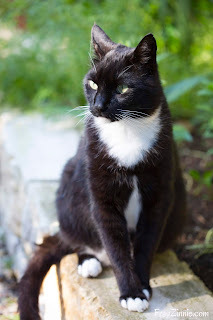 Strolling through the front garden (which provides a hint of what is to come as you venture deeper into the property), was Sancho, Hutson's cat, who also served as an ambassador for the garden aficionados descending on the property. 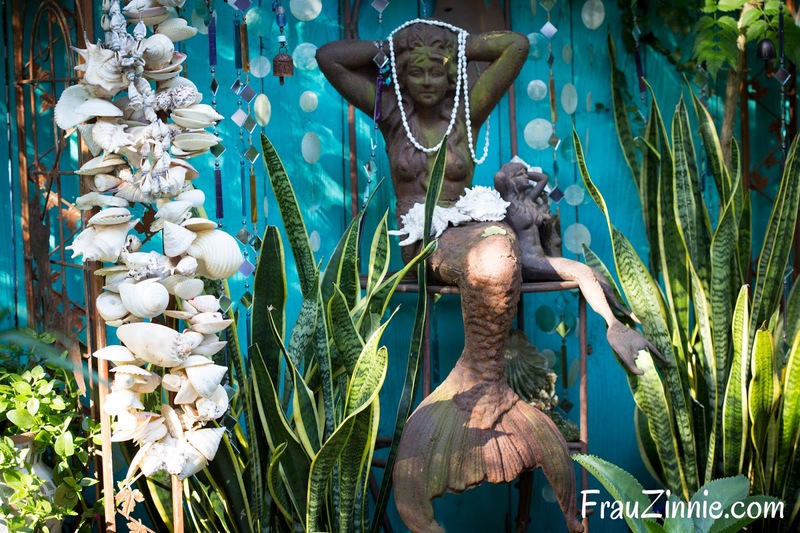 The area that used to be the driveway has been transformed into several small courtyard gardens, including a Mexican mermaid grotto. 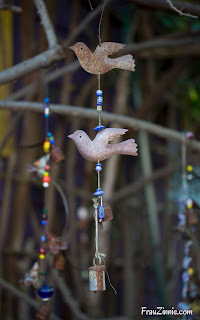 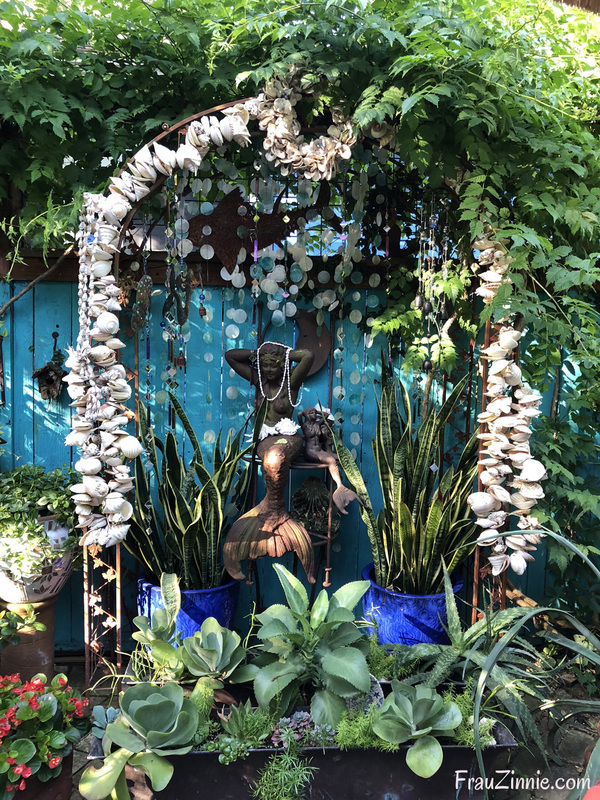 There was so much to take in on our brief visit to Hutson's garden that I actually discovered more from reviewing my photos after the event, such as in this area with an arbor covered in seashells with the mermaid as the main focal point. 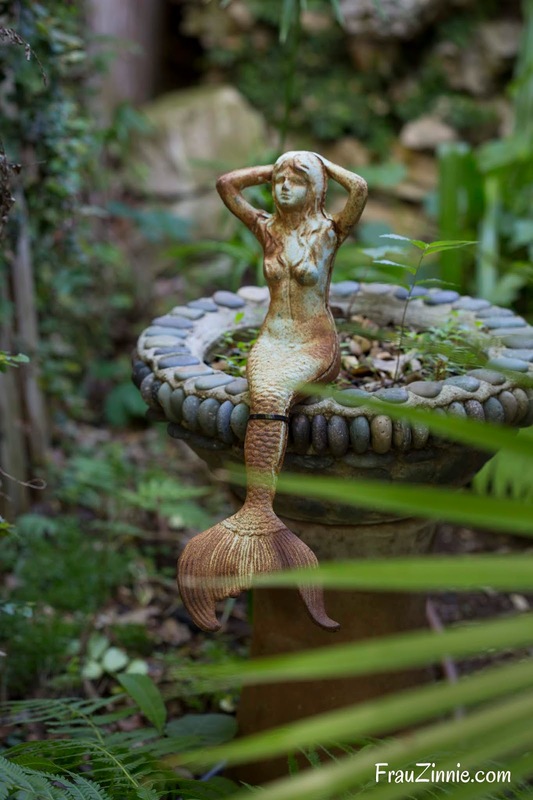 I love how Hutson placed snake plants alongside her, to mimic seaweed under water. 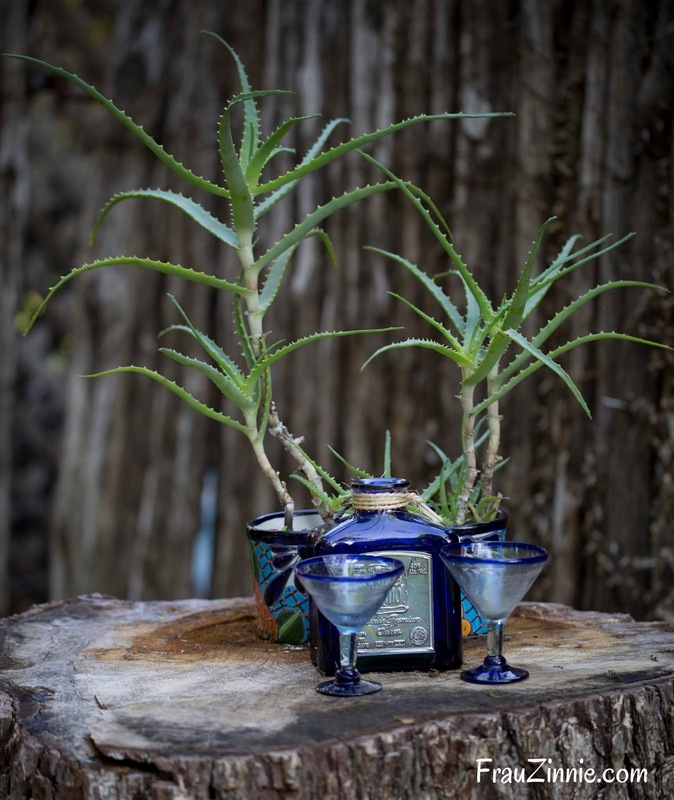 Additional courtyard gardens included a raised kitchen garden, a salad “bar”, a deck for entertaining, and a tequila cantina. 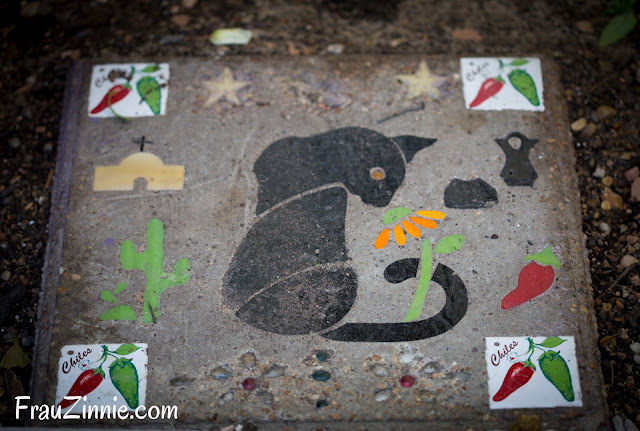 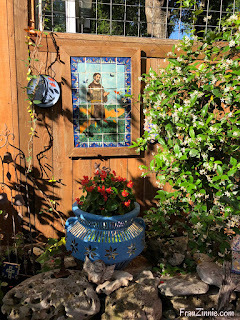 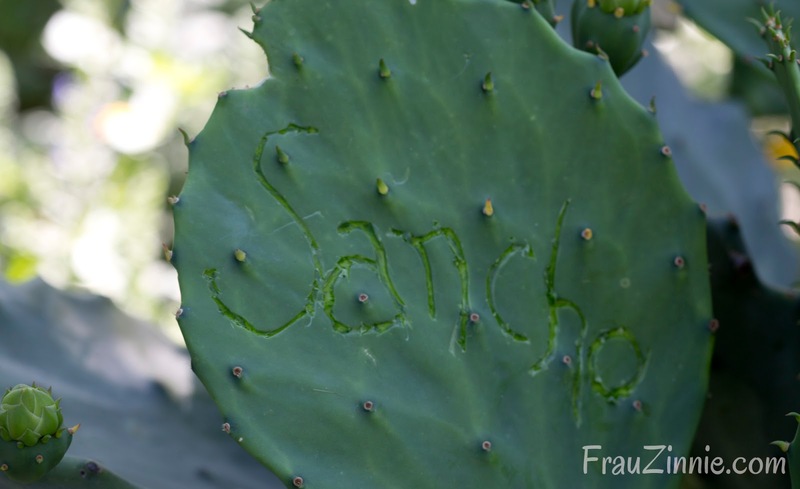 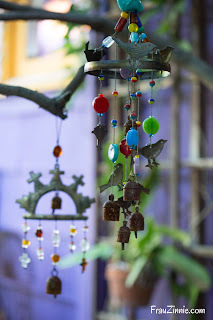 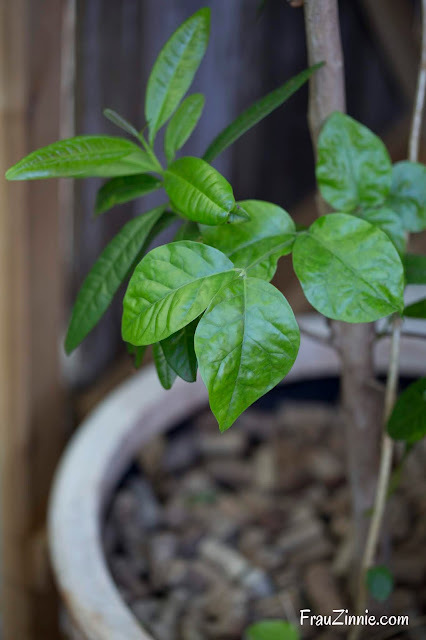 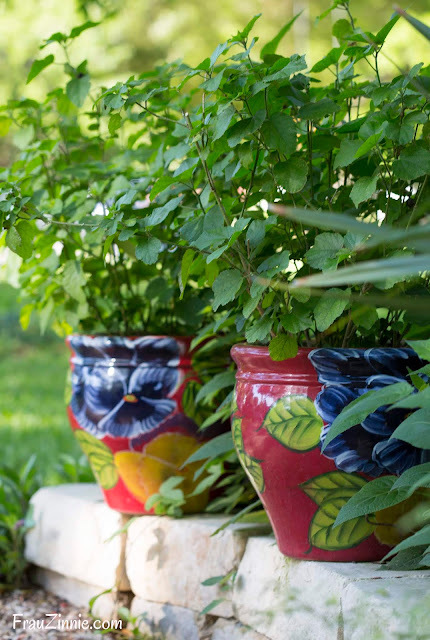 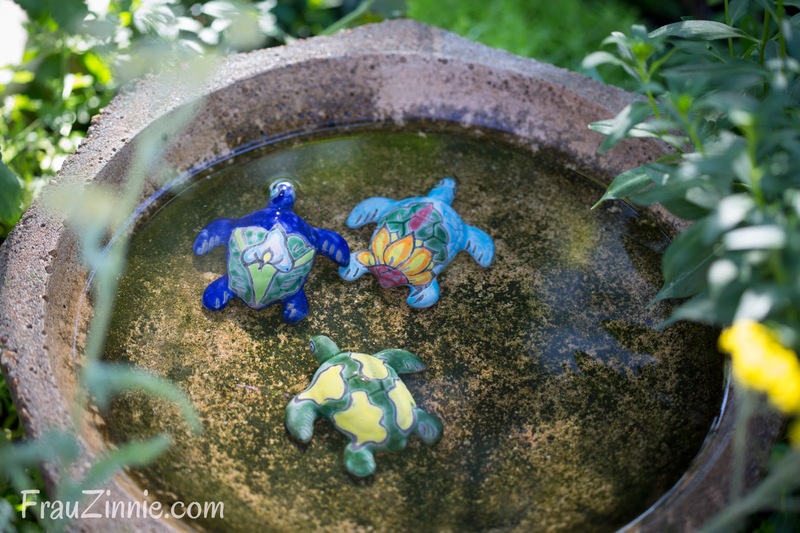 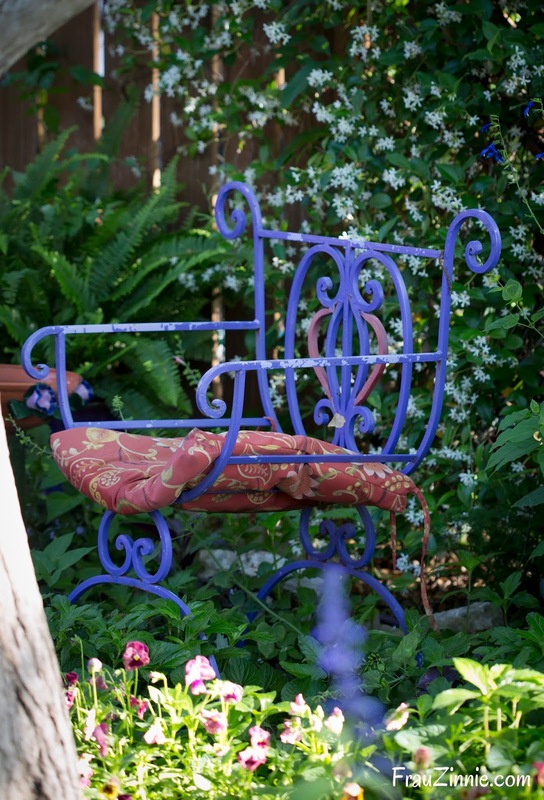 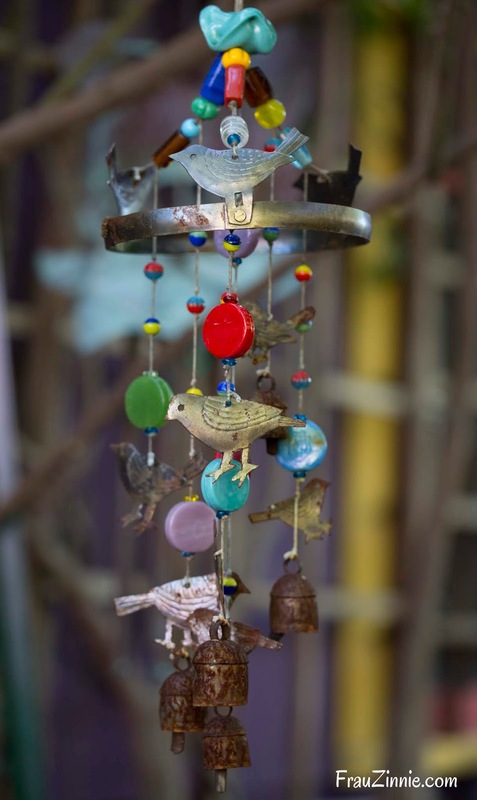 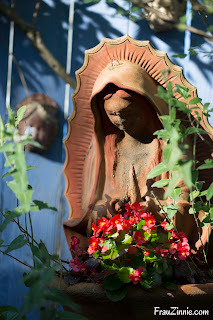 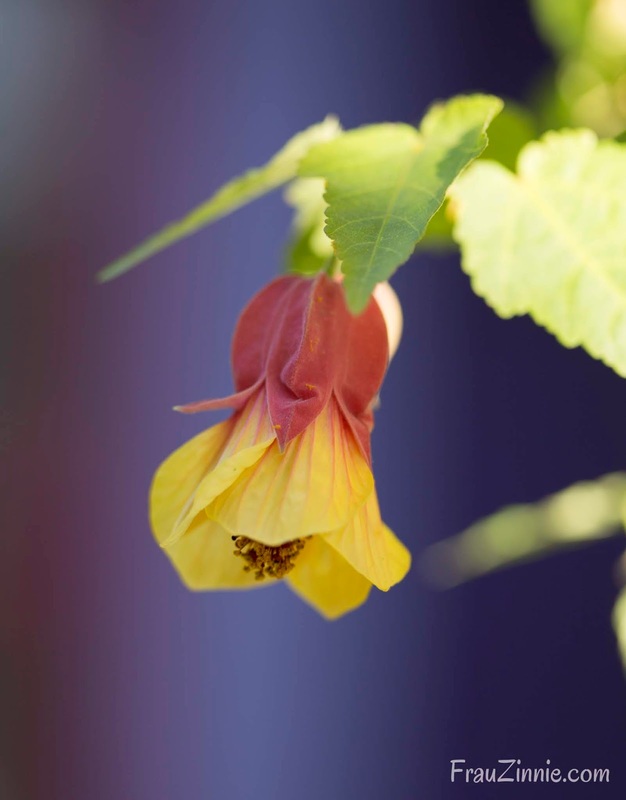 The touches of Mexican culture in Hutson’s garden can be attributed to travels through Mexico, which she also credits for her love of plants and herbs. 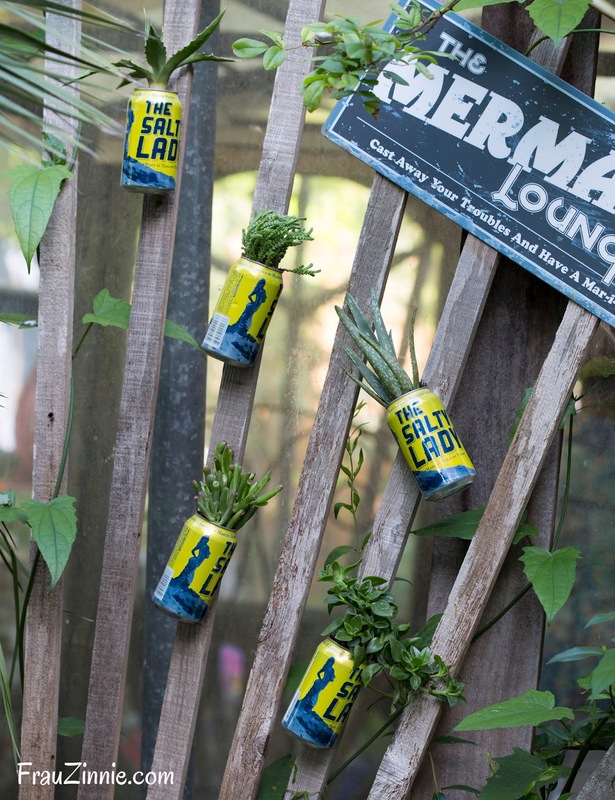 “Most homes had fresh herbs and flowers, sometimes growing in old gallon cans painted bright colors instead of in pots,” she said in the handout. 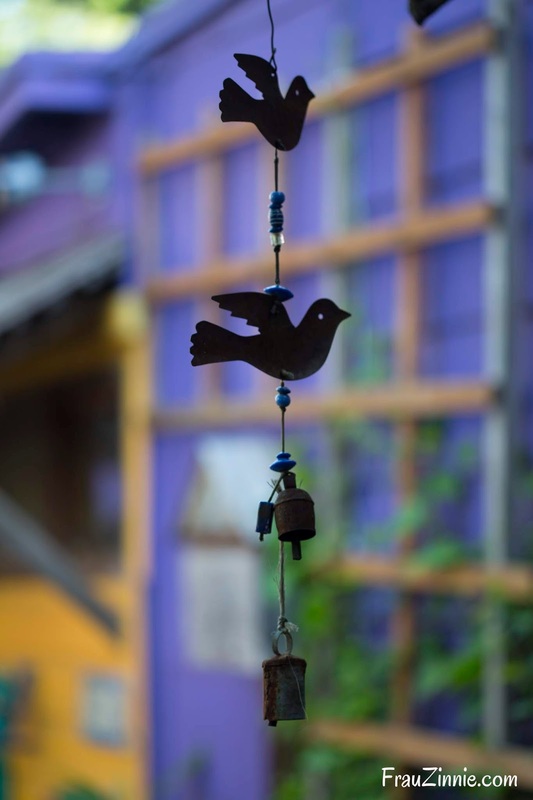 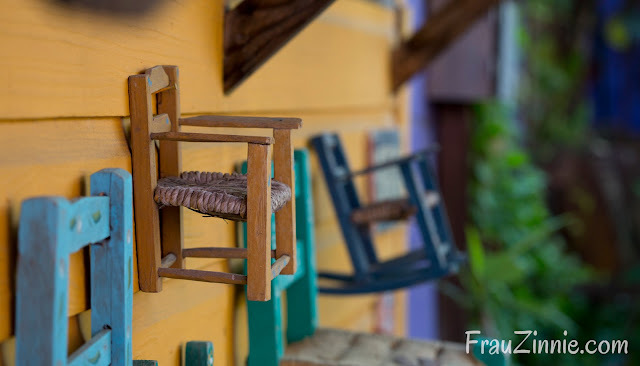 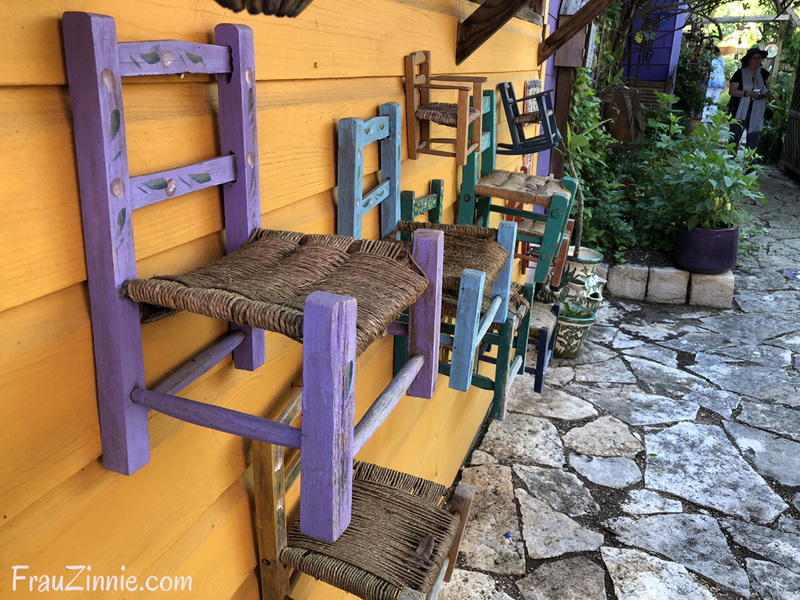 Along a wall on the side of her garden is a hanging display of colorful children’s chairs, just as they display them in Mexico. 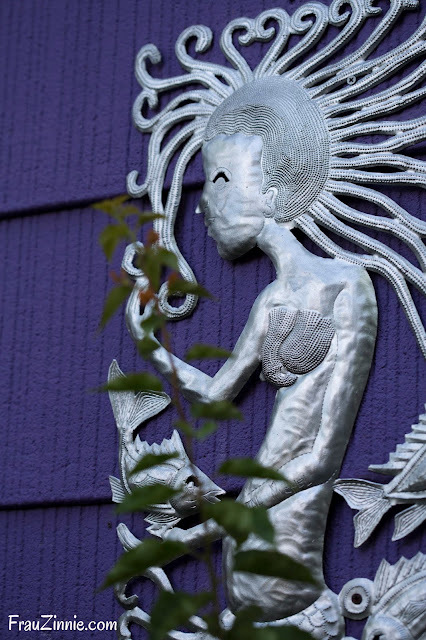 There are also various metalwork sculptures attached to an exterior portion of her home, with its silver color complementing the bright purple siding. 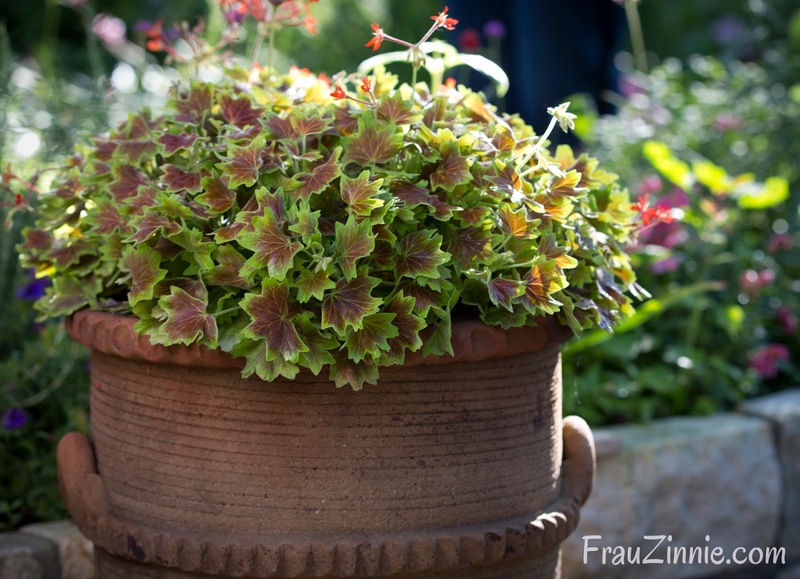 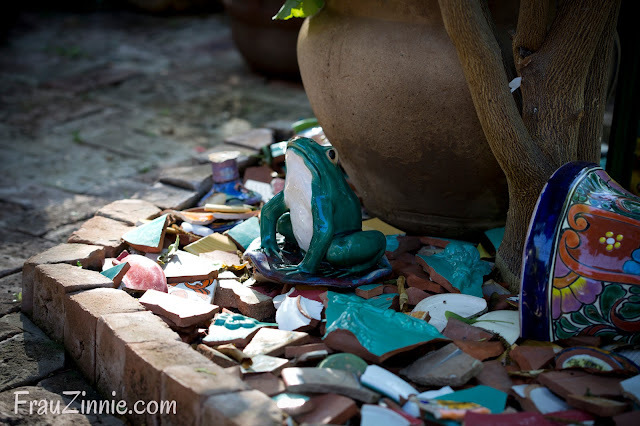 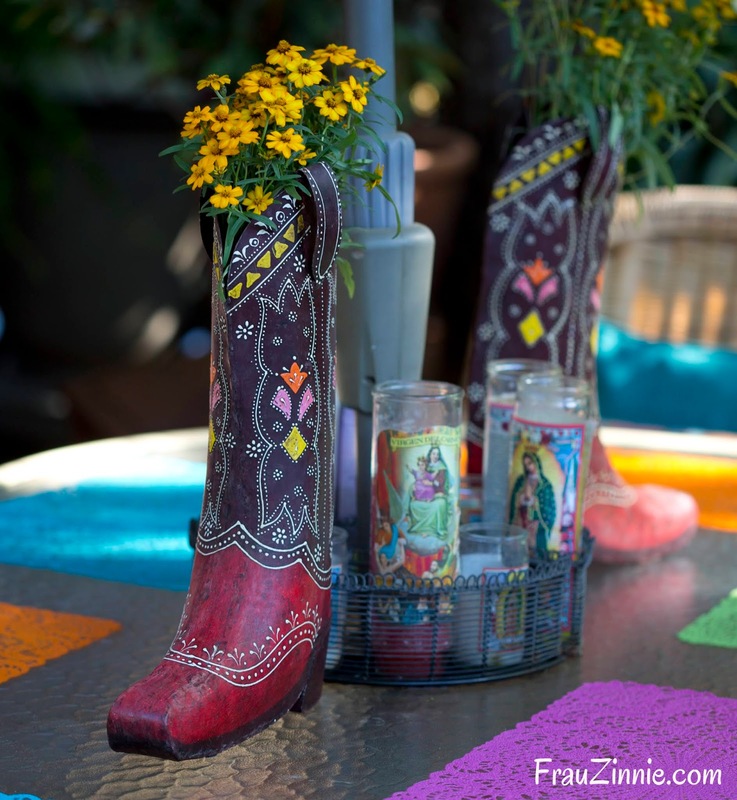 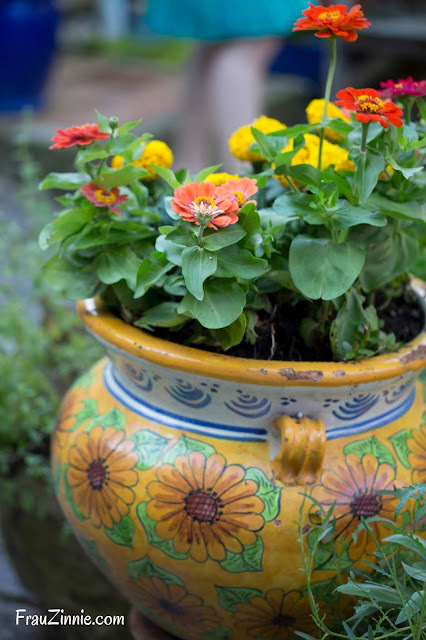 In fact, there were so many details found in Hutson's garden, including lots of decorative pottery for plants to cowboy boots used as a centerpiece. 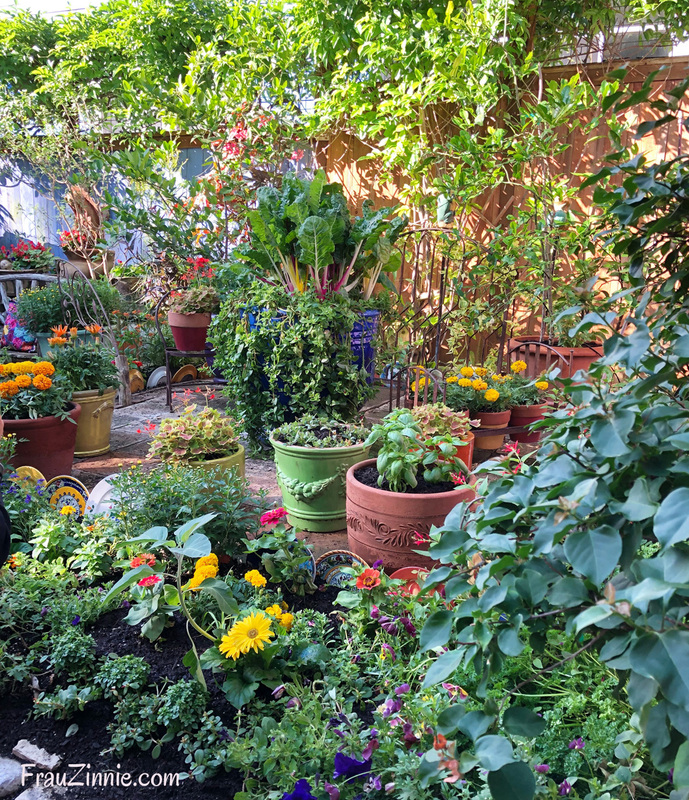 A main challenge of this lush landscape is watering. 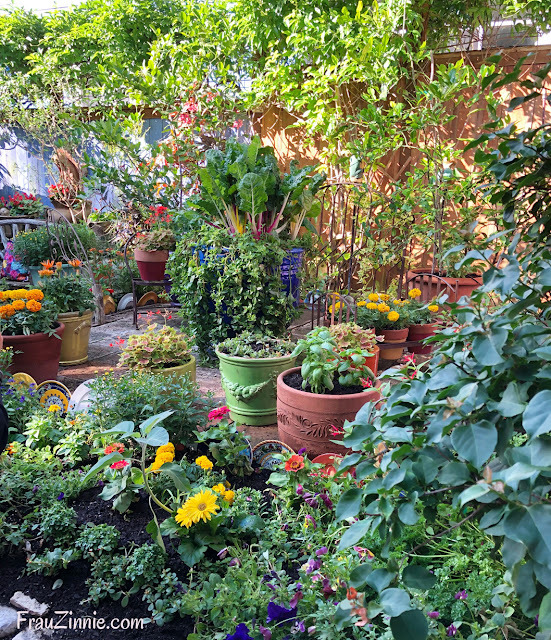 Hutson has a drip system installed but waters via the hose for “hours” during the summer. * Attendees of the Garden Bloggers Fling were given handouts about each garden featured on the tour. 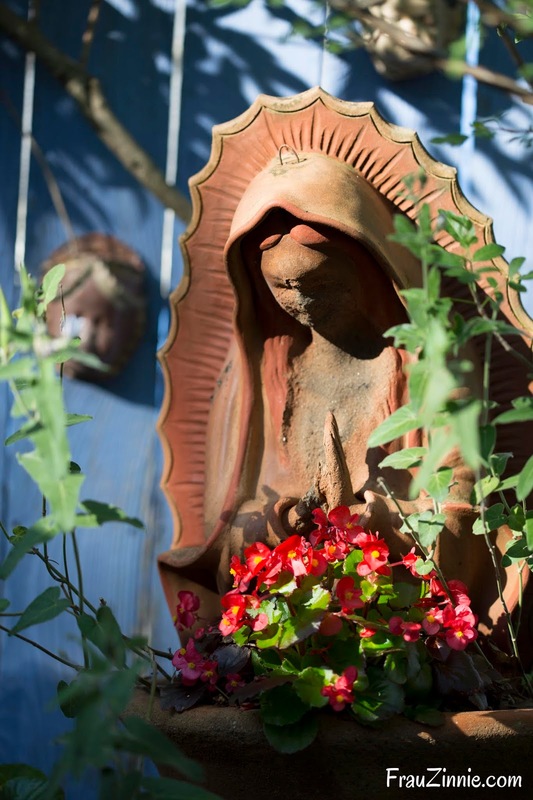 Quotes from this story are taken from the handout. 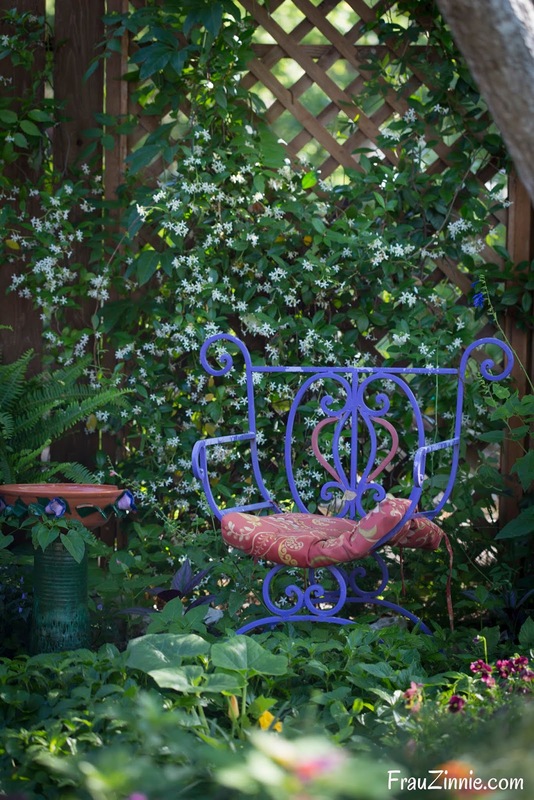 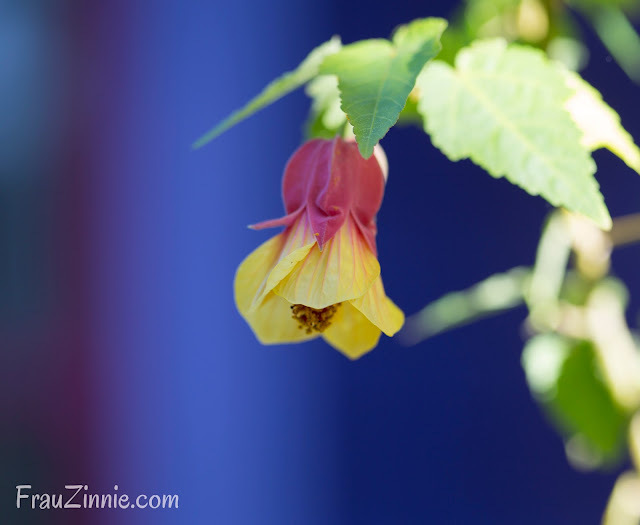 Photos of the garden from all seasons can be seen on Hutson's website.